Computational pragmatics aims at capturing inferences humans draw from an utterance within a discourse that go beyond the literal meaning of the words. In this talk, I will illustrate how looking at pragmatic information of what speakers are committed to can improve NLP applications, and also provide insights to questions in theoretical linguistics. Our understanding of an utterance depends on assessing the extent to which the speaker stands by the event she describes. An unadorned declarative like “The cancer has spread” conveys firm speaker commitment of the cancer having spread, whereas “There are some indicators that the cancer has spread” imbues the claim with uncertainty. It is not only the absence vs. presence of embedding material that determines whether or not a speaker is committed to the event described: from (1) we will infer that the speaker is committed to there *being* war, whereas in (2) we will infer the speaker is committed to relocating species *not being* a panacea, even though the clauses that describe the events in (1) and (2) are both embedded under “(s)he doesn’t believe”. (1) The problem, I’m afraid, with my colleague here, he really doesn’t believe that it’s war. (2) Transplanting an ecosystem can be risky, as history shows. Hellmann doesn’t believe that relocating species threatened by climate change is a panacea. I will first focus on an application-driven perspective. Previous work has tried to predict the outcome of contests (such as the Oscars or elections) from tweets. I will show that by distinguishing tweets that convey firm speaker commitment toward a given outcome (e.g., “Dunkirk will win Best Picture in 2018″) from ones that only suggest the outcome (e.g., “Dunkirk might have a shot at the 2018 Oscars”) or tweets that convey the negation of the event (“Dunkirk is good but not academy level good for the Oscars”), we can outperform previous methods. Second, from a theoretical perspective, I will discuss an ongoing project which aims at constructing a large database of naturally-occurring sentences (such as (1) and (2)) in context, rather than focusing only on the sentence level (which is often the case in tweets). I will show the potential that the database offers to complement existing experimental work in deepening our understanding of the factors at play in identifying speaker commitment. Marie-Catherine de Marneffe is an assistant professor in Linguistics at The Ohio State University. She received her PhD from Stanford University in December 2012 under the supervision of Christopher D. Manning. She is developing computational linguistic methods that capture what is conveyed by speakers beyond the literal meaning of the words they say. Primarily she wants to ground meanings in corpus data, and show how such meanings can drive pragmatic inference. 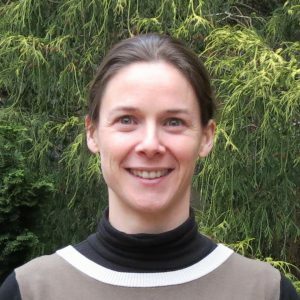 She has also worked on Recognizing Textual Entailment and contributed to defining the Stanford Dependencies and the Universal Dependencies representations, which are practical representations of grammatical relations and predicate argument structure. She serves as a member of the NAACL board and the Computational Linguistics editorial board.